Early Learning Centre (ELC), established in 1974 is a household, trusted toy brand within the UK. Supply of a select range of its baby, nursery and toy lines are available through distributor Baby Brands Direct to approved UK independent retailers. This month additional product lines have been added to the wholesale range from gyms to hoppers! 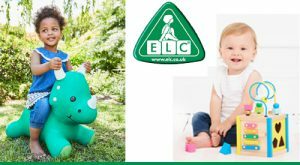 The ELC inflatable Hoppers are great for encouraging activity, bouncing about and with fun characters creating adventures is made easy! The range includes a friendly dinosaur, a pink unicorn and a new for 2019 is a grey rabbit hopper. Kids will surely love these and get them moving indoors and outside, with parents creating obstacle courses and encouraging interaction with other kids on hoppers. Also new to the collection is the ELC fish bubble making machines that are available in 2 appealing colourways (pink/turquoise, and orange/blue). Babies enjoy and are fascinated by watching the bubbles while older children are encouraged to chase after them. With a reasonable SRP and backing of a high quality brand name, this is definitely one for retailers to stock. Ideal for nurseries and those retailers looking ahead for stock for the summer months, we now have the ELC My First Sand and Water Table. The product is super for outdoor fun, with kids enjoying the texture and play value of sand combined with water – combining splashing, pouring, sieving and sculpting. It also comes with 3 toys, a lid and detachable legs for easy storage. The Happy Land range by ELC is a must have for all good retailers, with the figures perfectly sized for little hands to grasp and playsets that will spark and delight imaginations. The figure sets within the wholesale range has increased to include the original classic family set with dog, and ethnic family set with cat and now a fairy tale set! This set notably includes a unicorn, dragon, wizard, princess and soldier. 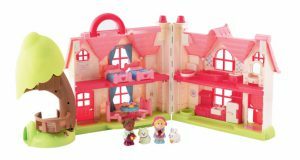 A gorgeous Happy Land 2 storey doll’s house playset, called the Cherry Cottage, has also been added – opening out providing ample rooms, a garden with treehouse, and characters and pets. Within the core toys category, there are also some exciting trade additions, including 2 bath time toys. One is a frog style bubble blower that affixes with suction caps and the other ideal for role play and fun in the bath is the Tea Party set that has a floating shape sorter tray, 3 cake design squirters, 2 cups for sieving and a transparent tea pot. Also NEW is the colourful wooden activity cube – a first at Baby Brands Direct from the ELC brand. Offering 5 sides of play, its top houses a bead run (that can be stored inside the cube), and the sides a shape sorter, xylophone, maize and clocks. 2 classic toys that have been refreshed for 2019 include the highchair pat mat and singing animal keyboard. Within the staple nursery collection, the supply of Sit Me Ups has increased to include the ELC Blossom Farm Belle Bunny. Gorgeous in pink, grey and cream, the item offers parents longevity of use with its 3 parts; the playmat that can be used with the 2 inflatable pillows to create a nest for baby in its early days and re-arranged stacked for sit up support as little one grows. The blossom farm flower activity gym, with extra padded circumference for tummy time and snugness, comes in neutral colours with toys and removable arches. Baby Brands Direct is an award winning, leading UK distributor to the nursery retail sector. ELC products constitute a valued brand within the mix of global brands that are available to approved independents. Log in now and test for yourself the service available to your store. If you are looking to open an account please register here – kindly note you will need a minimum of your own website or physical shop for access.